This is one of the heaviest pool tables I have ever moved. 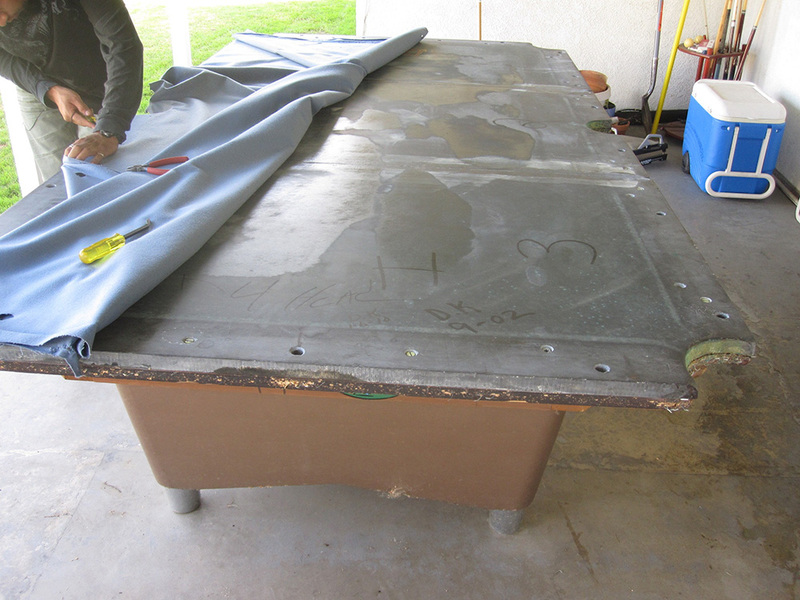 It’s a 4.5×9 foot AMF pool hall table. I was recently hired to move this monster pool table for a third time. 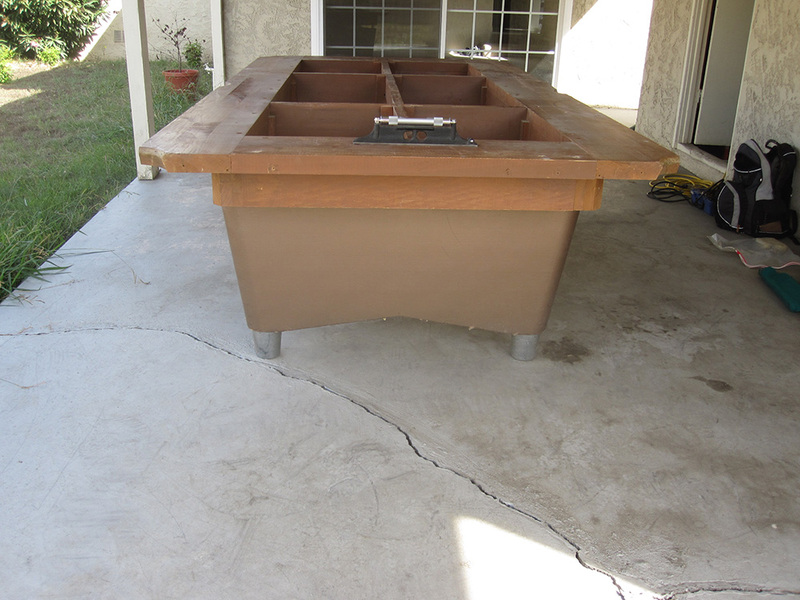 I originally moved it for a former client in San Juan Capistrano, CA. She had it setup in her garage for her teenage son and his buddies to play on. Her son had been saving his money for years and finally had enough to buy his first car. 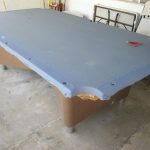 The pool table had outlived it’s usefulness and was sold to make space in the garage for sonny’s brand new car! 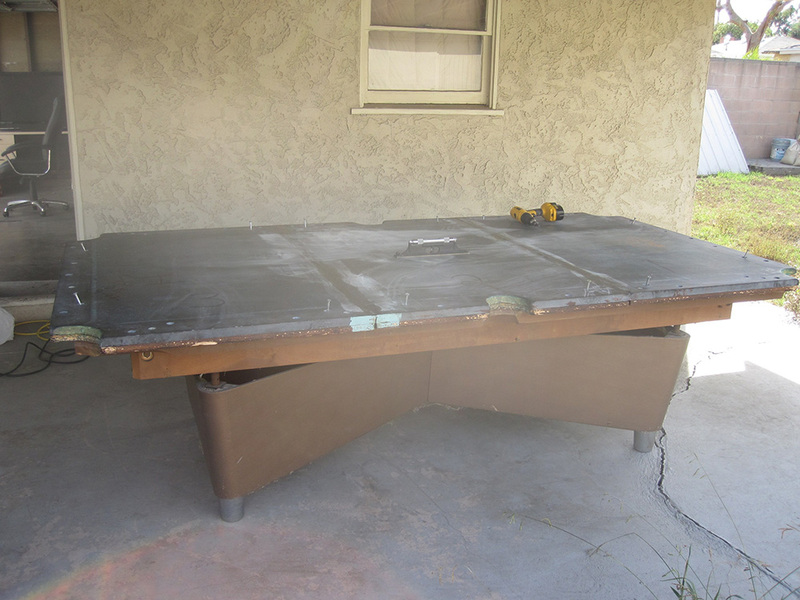 The new owner of this nine foot AMF pool table was technically homeless. 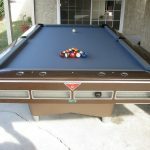 Why might you ask is a homeless person buying a pool table? 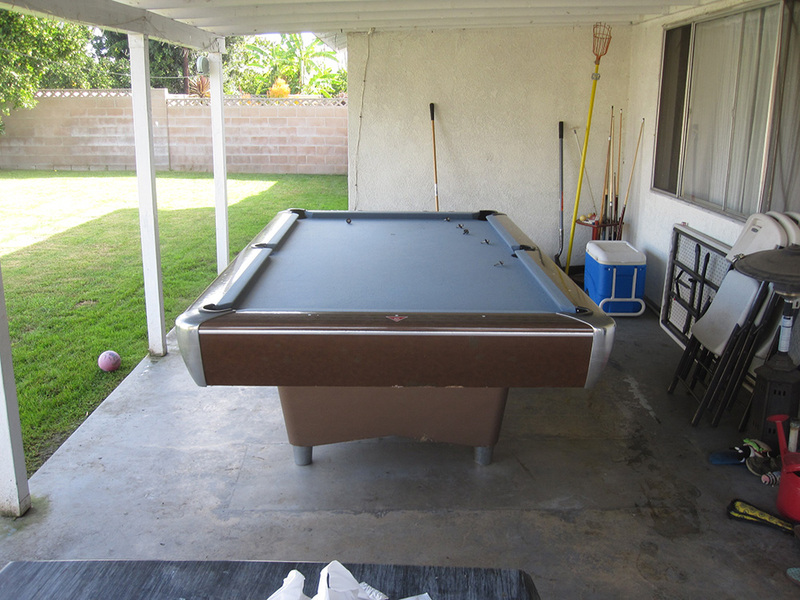 Well, he was house hunting and was presented with an opportunity to buy an excellent pool table at a great price. 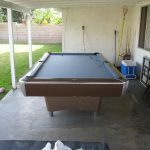 So my client’s newly acquired pool table was going to his Sister’s house in Westminster, CA until he could find a home of his own. 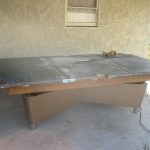 The pool table stayed in Sister’s patio for about six months until recently, when my client bought his first home in Long Beach, CA. We moved the heavy duty AMF for a third and final time to my client’s patio. I had stretched the bed cloth for the last time in Westminster. 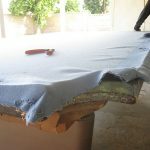 We ended replacing the bed cloth with a new piece of Mali 10820-f Cadet Blue. 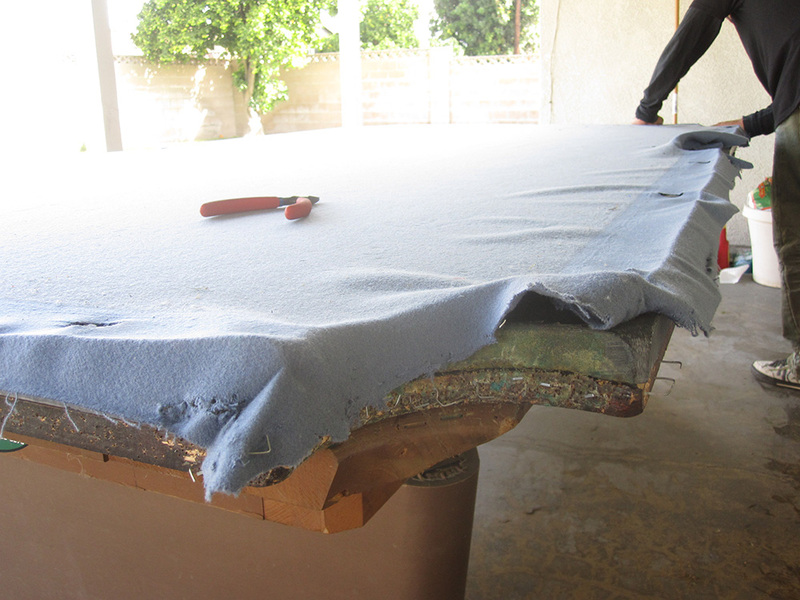 Even though the rail cloth was from a previous refelting it matched the new bed cloth pretty well. I recently picked one of these tables up. It is three price slate, and is beautiful shape. It came disassembled, is there a manual anywhere to put it back together? We have a similar table, however it does not Have the legs/base. Does anyone know where we can find some? you would have to fabricate them or find the exact same model. Pockets on the AMF pool tables are standard drop pockets. You can order them online somewhere. Have the same table listed for sale for two weeks for 1000$ just lowered it to $750 today and am getting a few I bites. But after reading your comment above I’ll probably donate it to a boys and girls club or somewhere similar. It’s an awesome table, just won’t fit in my new place. And it’s insanely heavy. 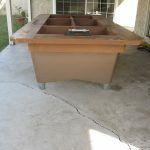 we have one just like this and I am wanting to sell it.. Do you know anyone who is interested we also are located in Orange County. Yorba Linda to be specific. Hi Amber, you’ve got a real workhorse of a pool table. 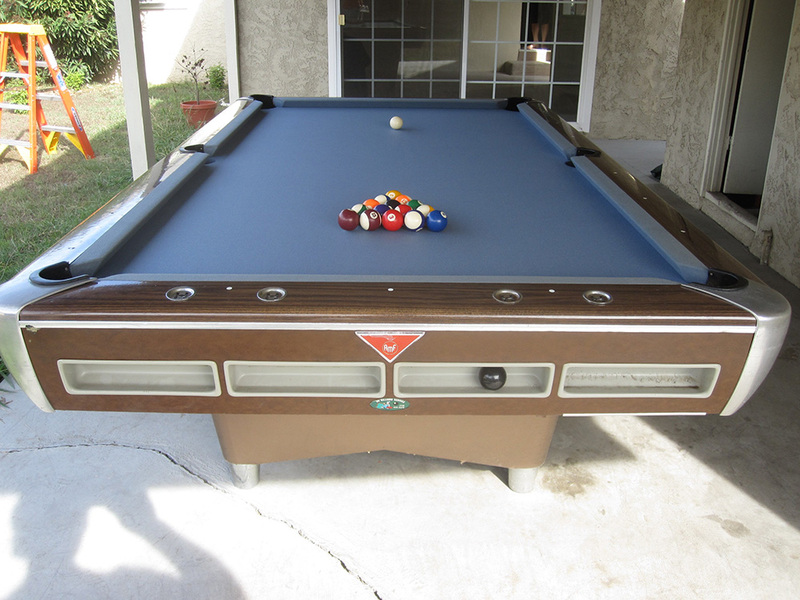 Unfortunately commercial style nine foot pool tables are not as sought after as furniture style tables. You might consider donating it to the boys & girls club in your area. If you tried listing it on craigslist you might find a buyer willing to pay up to $800-1000. Thanks for your comment, Dave. I have moved a table like this one from calif to Tn. the moving co stood the boxed in slate on end and it is broke in several pieces it appears that it is 3/4 inch slate and no one in this area seems to be able to replace it or fix it the pocket aluminum ends are stamped 1962…can it be repaired? Hello Vern, do you still have the broken pieces? 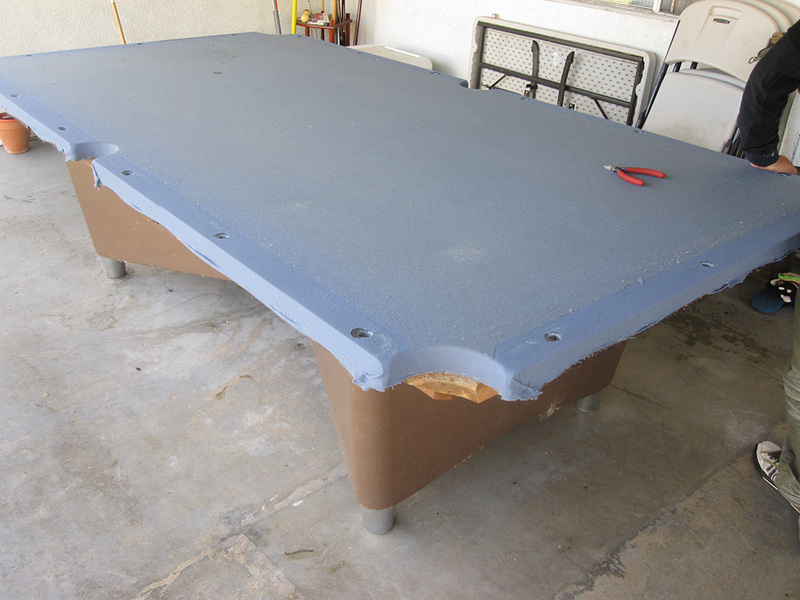 If your pool table slate is broken into two or three large pieces you can have a billiard mechanic just epoxy the broken pieces back together. I’ve done this in the past and it’s worked fine. 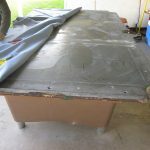 If the slate is totally shattered you can probably find a pool table dealer who has some spare pieces of slate that he saved that would act as a replacement to your destroyed piece. As long as the pieces of slate are the same size and approximate thickness any manufacturers slate would probably work. You will most likely have to drill new holes into the new piece of slate so all the railbolts will align with the holes in your rails. You may also have to drill new holes for the slate mounting screws. If you use the right type of drill bits this job is not too hard. Best regards, Dave. I have a very similar table by AMF, what are they worth in mint condition? Mint condition, probably around $2500. But you’d have to wait some time for the right buyer. Most people are not looking for nine footers. It would have to be someone who’s really into playing pool such as a tournament player. Or just somebody who likes the retro style. Thanks for your comment. Do you happen to know what year this table was made? We have the same one.